Can we not have leaders in our government who are willing to take a stand for what they truly believe in? Is it acceptable to have representatives in our government who break and give in to pressure from others? That’s exactly what Rep. Dennis Kucinich has decided to do with his vote on Obama’s health care reform bill. Kucinich, a Democrat, was one of the load roaring voices within the Democratic party that stood against President Obama’s health care reform. 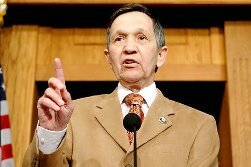 But because of mounting pressure from the Democratic party, and from President Barack Obama himself, Kucinich has changed his mind and will “reluctantly” vote for Obama’s health care bill. From the NYDailyNews.com, “I have taken this fight farther than many in Congress have been willing to take it,” Kucinich said, arguing that he owed it to his constituents to push for a single-payer health-care system that ends the power of insurance companies. Man… what a disappointing day indeed to know that our elected officials in Washington are caving in to pressure, and casting a vote for a bill they truly do not believe in.